“I love doing laundry!” said no one ever. And I was especially not a fan of doing my family’s laundry in our cold garage with the washer and dryer seven feet apart from each other. 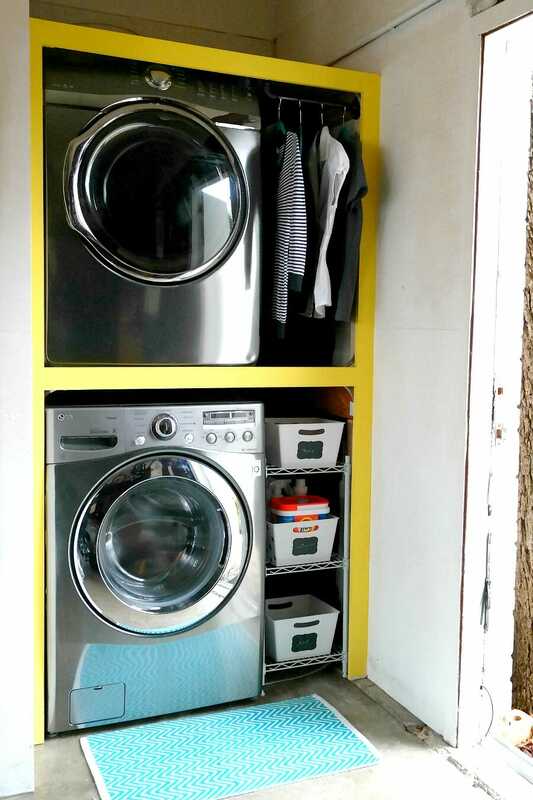 After two years in our home, it was time to give our laundry room a much-needed makeover—and by room, I mean nook in our garage. We mapped out a plan to stack our washer and dryer, add a rack for hanging clothes, and install shelves for handy organization. I won’t go as far as to say I love doing laundry, but our new space makes the process so much more easy and efficient—and best of all, it’s much easier on the eyes. If you’re currently planning your own laundry room remodel, here’s how you can make the process as easy as possible. Make a list of must-haves. Decide what to DIY and what to hire out. Do you need to special order anything? It’s just a laundry room—don’t overstress yourself! When does your project need to be completed? How will you do your laundry while you are renovating? At a friend’s or family member’s house? At the laundry mat or with a laundry service? This is important to fully think out so that you can decide what parts of the remodeling project you can realistically DIY and what parts you should hire out. Do you need counter space for folding laundry? More shelves? Closed cabinets for storage? A rack to hang clothes? An ironing board or sink? Will you need to add outlets or move gas lines, vents, or add outlets? Make a list before you start any of your project, so that you won’t have any unexpected surprises once it’s too late. If space is an issue, consider the possibility of stacking your washer and dryer to save a significant amount of space in your laundry room—but note that this can only be done with a front load washing machine. We had a very small nook to work with, so stacking our washer and dryer was essential to making our laundry room a functional space. 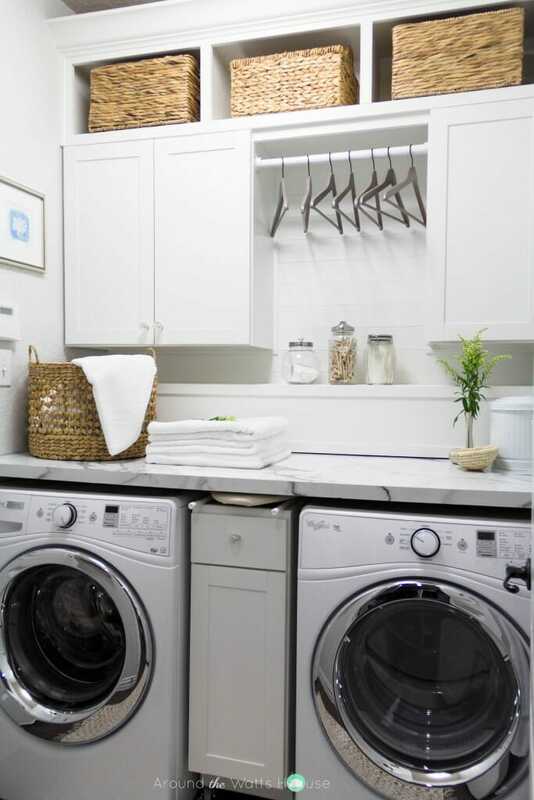 Start a laundry room inspiration board on Pinterest to see how others have effectively organized their laundry room space—especially rooms that are similar in shape or size to yours. You might not have thought of mounting an expandable drying rack to the wall, or adding a bench with hooks for coats, hats, and backpacks if your laundry room also serves as your mud room. Of course, it’s not all about function, but fun, too. Maybe you’ve dreamed of having your own wall of clean, trendy subway tile, or a boldly experimental color scheme. 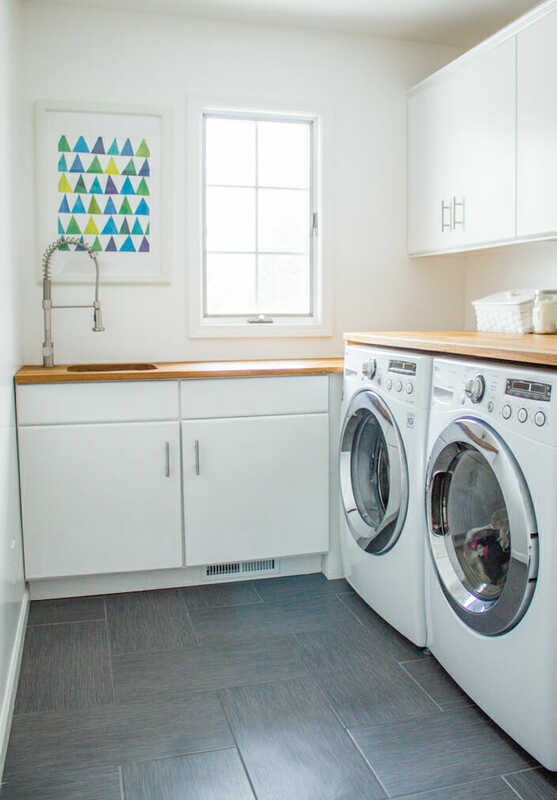 We spend many hours of our week in the laundry room, so yours should be a cheerful and beautiful space that makes doing chores, well, almost pleasant! My family is all for DIY (Do-It-Yourself) projects, but there are still some things we aren’t comfortable doing ourselves. For our laundry room renovation, we had to move a gas line and install a new dryer vent—and we had no qualms about hiring a professional to tackle these potentially hazardous tasks. As much as you love taking on a new project, it’s important to know your limits and when it’s best to leave it to an expert. Will you need an electrician or plumber? Drywall? What about demolition? Spend time planning out how and when the work is going to be done, how long it will take, and how this will affect your laundry room use in the meantime. As with any remodeling project, there will always be surprises that pop up just when you think you’ve thought of everything, so be sure to give yourself wiggle room in your budget. If you’ve decided to tackle some of the renovation on your own, don’t forget to account for quality tools, in addition to all your other supplies. For the sake of time and budget, choosing items that are in stock at your local hardware store is your safest bet. 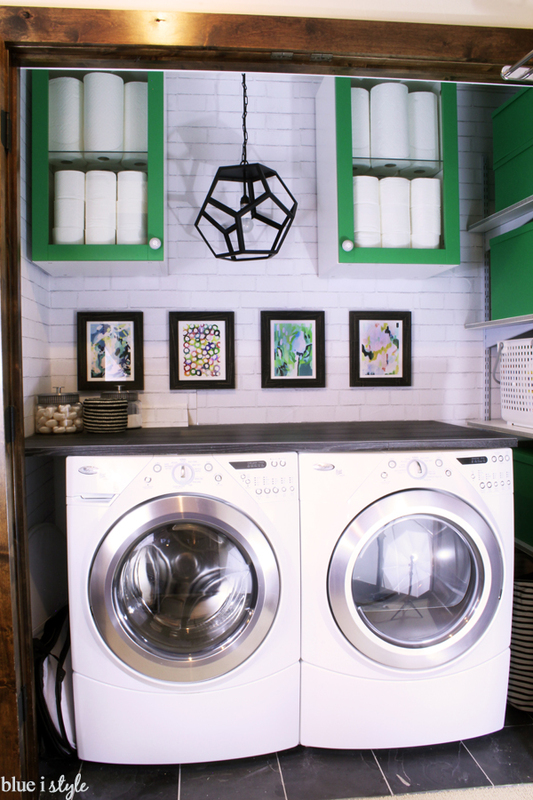 But in order to make your laundry room truly unique, you’ll likely want to special order a few things—perhaps a handcrafted pendant light or even some funky drawer pulls. This could add a bit of lead time, so make sure to plan accordingly. Also, things like countertops and custom cabinets can take extra time to be constructed and installed, so planning ahead here is key. Yes, it can be quite a bit of work, especially if yours is an expensive or labor-intensive remodel, but these tips will ensure that the project runs as smoothly as possible. In the end, you’ll have a beautiful new laundry room to enjoy for as long as you live in your home. Who knows, you might even find yourself making excuses to throw in another load!